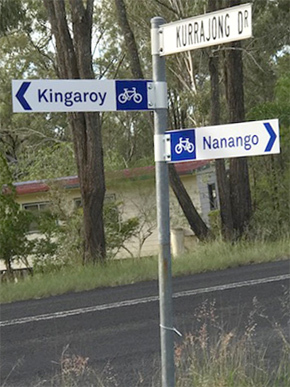 Last week, a route joining Yarraman to Kingaroy was signposted to direct cyclists and walkers along “The Link”. 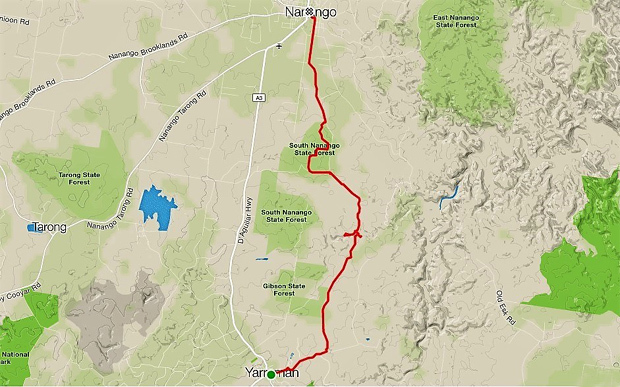 The project makes use of an old stock route that connects Yarraman to Nanango, and lightly trafficked roads between Nanango and Kingaroy. “The Link” has created a continuous 305km trail stretching from Wulkuraka to Kilkivan, and joins the South Burnett to the longest rail trail in Australia. The project began several years ago after the Brisbane Valley Rail Trail was extended from Blackbutt to Yarraman. Former South Burnett councillor Barry Green drew public attention to the stock route, which was once used by drovers to get their beasts to the Yarraman railhead when the Brisbane Valley rail line was still in operation. Barry later used his own funds to erect two signs at either end to mark the stock route’s existence. 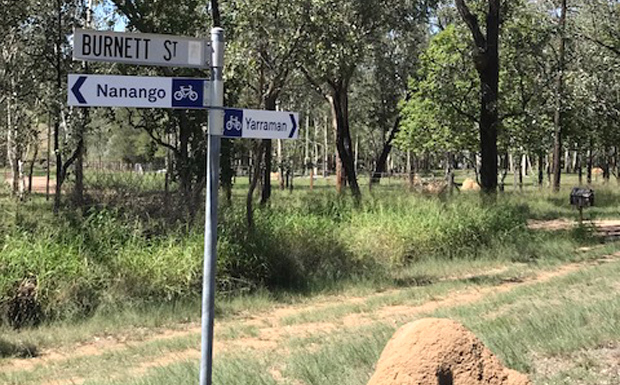 Soon afterwards, his idea was enthusiastically taken up by Nanango residents David Kenny and Mark Gaedtke, who are both members of the Heritage Nanango Community Fund’s Board and keen cyclists. The pair mapped out a 55km trail from Yarraman to Kingaroy using the old stock route and local roads, then proposed Heritage fund the cost of signposting it. The Heritage Community Fund’s board agreed to the idea and asked the South Burnett Regional Council if they would agree, too. Last December, Councillors gave the idea their unanimous support, and Council officers began working with Heritage’s representatives soon afterwards to determine what form the signage should take. The project also attracted support from the South Burnett Rail Trail User’s Association which thought it was a great way to connect all the South Burnett’s major towns in a way the former railways had never managed to do. In the end, signs on “The Link” are similar to those used to signpost cycling trails on the coast. They show direction and – in some cases – distances along the route to guide cyclists and walkers safely. On Friday, David Kenny told southburnett.com.au the South Burnett Regional Council had been very helpful guiding the group through the complex maze of rules and regulations that surround signposting. David said the section between Yarraman and Nanango was particularly beautiful, but it has one 2km stretch where the road surface is rough. Because of this, that stretch carries extra signs advising cyclists to dismount and walk rather than ride if they’re not confident and experienced cyclists. “But the rest of the route is great, and it takes you through some really pretty, unspoiled countryside,” David said. He hopes that at some time in the future any rough spots can be smoothed out. 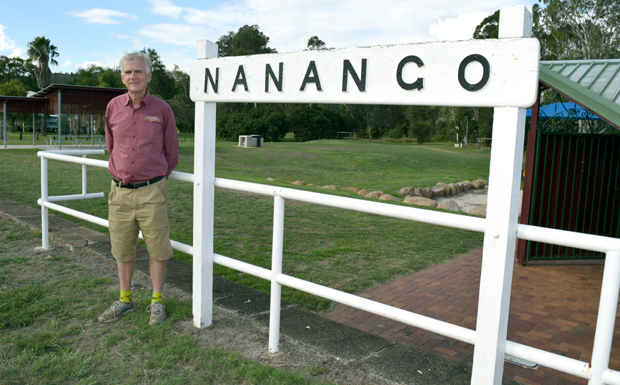 Because the former Nanango-Kingaroy railway land was sold off soon after the line was closed on July 1, 1964, there are very few traces of it left. However, David believes the signposted route between both towns using little-trafficked back roads is a good substitute. The next step for the project will be to prepare maps of the “The Link” trail for distribution through local Visitor Information Centres. David and Mark would also like to see bicycle racks installed in Nanango’s CBD and at Ringsfield House.